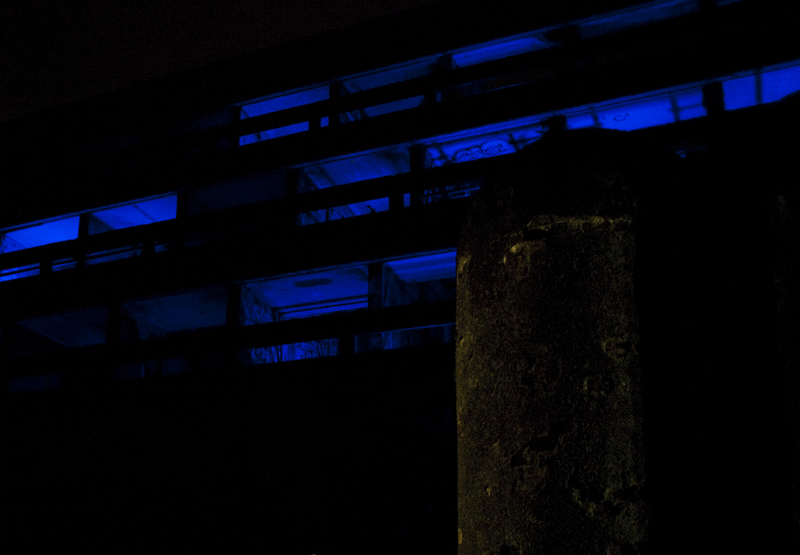 Last night I was fortunate to be able to go to the Hinterland event at the derelict St.Peter’s seminary in Cardross. 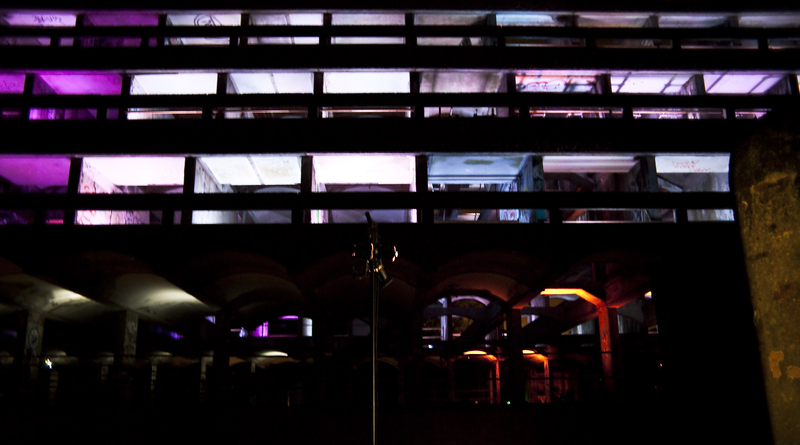 As some of you know, my love and fascination with Brutalist architecture goes back a long time, and my years of living at the Barbican centre in London will forever be enshrined in my memory as perfect architectural bliss. 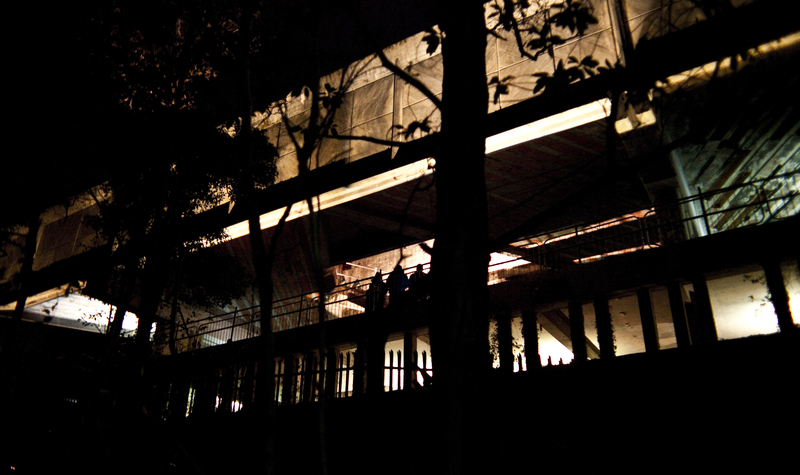 The site of the abandoned St.Peter’s seminary has been on my architectural radar for a while, but I had always hesitated to make the trip there for fear of unexpectedly bumping into some of the vandals that have been steadily dismantling the site. I am not talking about some of the absolutely stunning graffiti that has happened there over the years, but rather the smashing of the fairly sizeable altar stone (how???) and other such random acts of destruction. So when the Hinterland event was announced as part of the opening event of the Festival of Architecture 2016, my tickets to go were booked immediately. Arriving at the site by shuttle bus, we were handed illuminated walking sticks to navigate through the dense woodlands along a footpath that featured a rather spooky sound installation on some sections and led to the small back door of the sacristy. The outer wall of the sacristy immediately reminded me very strongly of Le Corbusier’s Chapelle Notre-Dame-du-Haut, with its incredible thickness and tiny square windows set deep into the wall. The highly regarded chapel was completed in 1955, a mere eleven years before the seminary opened in 1966. Le Corbusier was reportedly a significant influence on architects Gillespie, Kidd & Coia, and this is evident in many of the features of this beautiful Scottish Brutalist masterpiece, such as the long columnar walkways, the open layout of the main spaces and the tiny dimensions of the novice’s individual cells. 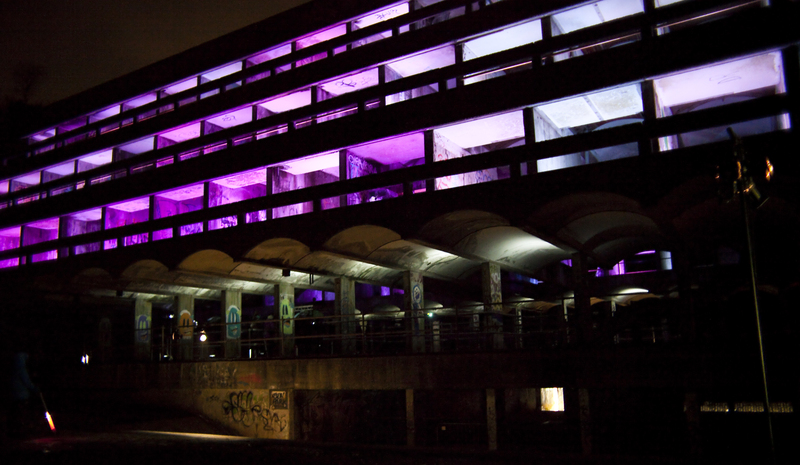 Following a sloped, spiral walkway into the main hall of the seminary to the broken altar, the light installation staged by NVA created a surreal and fantastical colourful landscape on the graffitied walls and pillars of the seminary. In what used to be the central area of the knave, an oversized ceremonial pendulum was suspended over a shallow pool of water and occasionally set in motion by two priest-like protagonists, spewing forth thick white smoke. This was accompanied by eerie abstract choral singing and a ritual of welding steel inside a cage situated on the far side of the pool, creating an incredible interplay of shadow and bright white light on the ceiling, columnar wall and surface of the water. Progressing through the seminary, it became obvious what a tranquil and meditative space it used to be, and this struck me most when coming out of the recreation block into a secluded inner courtyard. The seminary is much more compact in scale than I expected and from ground level a warren of complementary geometries opened up like a darkly lit multistorey labyrinth. We spent about two hours at the site itself, and even though photography was not permitted inside the building, I managed to take a few of the outside as seen from the garden, although many more beautiful professional images have been released online since the event opened last week, and there is also some video footage by others on Youtube. Arts organisation NVA have recently taken on the site, with an exceptional vision to turn it into a venue where experimental art and community engagement events can take place – head over to their website to watch the beautifully shot promotional video that explains their plans better than I could, and maybe make a small donation? Further funding of £4.2 million has just been announced and it now looks like all the pieces are in place to go ahead with the building plans and hopefully re-open in 2017/18. I was particularly pleased to hear that they want to remake the large lantern skylight that was lost over the years, and which was a particularly stunning feature of the original building. For a glimpse of what the seminary was like when initially built and used by the Catholic church to train priests, have a look at this fascinating footage from the 1972 architectural documentary “Space and Light” by Murray Grigor. In 2009, Grigor also released the shot-by-shot re-make companion piece “Space and Light Revisited”, visually contrasting the current decaying state of the seminary with its pristine original condition. I am already very excited about seeing the restored building in the near future, hopefully to return and take some more competent photographs.